Unprepared line marking is the method of laying paint or tape directly onto the floor with no mechanical preparation undertaken beforehand to improve durability. This is a very popular method in areas that only receive light traffic or where the layout can change regularly due to stock rotation etc. We also find that many customers opt for unprepared markings when they first move into a new facility as this allows them to ensure that they have decided upon the correct layout before having the lines laid using a more permanent solution later. 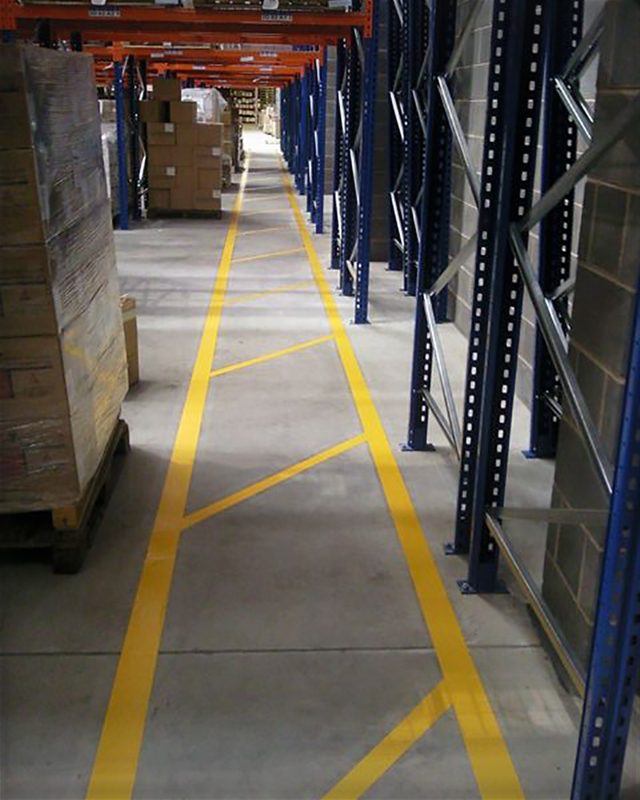 Warehouse Floor Marking Ltd have several types of materials available to use for unprepared markings, for markings laid with tape, the options range from standard vinyl floor tape through to a rigid PVC with an extra strength adhesive. To complete the range, we are also able to supply and install floor graphics such as pedestrian logo’s or lettering stencils such as ‘Caution FLT’s’ all of which are available in durable, self-adhesive, anti-slip vinyl. For unprepared line markings laid with paint, there are a huge range of materials available, unfortunately many of which can be of a very poor quality. Our vast knowledge and experience of painting warehouse floors has allowed us to trial various products and we believe the best materials to use are either one-part epoxy’s or acrylic paints as they are much more durable than other materials such as chlorinated rubber. The type of material we use on each project depends on such factors as the condition of the surface and access times etc, these are issues we would take into account during our site visit before deciding on the most suitable option. If you would like to arrange for one of our advisors to visit site and discuss your needs in more detail, please don’t hesitate to contact us. Contact us to discuss your needs and request a line marking quotation.